I’ve seen this scenario so many times, I had to address it. It goes like this; a woman gets divorced and feels completely alone. She becomes scared as her mind manifests thoughts of being alone for the rest of her life, completely unloved and bitter. So she starts to cling to any man who gives her attention even if she knows in her heart that she’s better off without him! To her the feeling of being with someone (even the wrong someone) is better than being alone. Ultimately she trades in part of her self-respect for a false sense of security. This is not love! It’s fear. As women, we naturally want to be in a relationship. From the beginning of time we’ve been wired that having a man means security. But if being with someone was so important that it trumps being happy, why did you get divorced? More than likely you weren’t happy and that lack of love drove you to separating your marriage so the last thing you want to do is run out and find a man to fill that void after your divorce. You need time. After my divorce, I was scared to death as I realized that I was completely alone and on my own for the first time ever. Not only that, I had two kids to look after. It’s scary as hell but it’s also a blessing in disguise. Here’s why. The most important person to love is you. You are more valuable than you realize. We are our own worst critics and often we don’t realize just how wonderful we are until we are forced to learn about ourselves. You have to take some time right after your divorce to learn about the things you love about yourself. Not the weaknesses but your strengths, the good things about you that you want to share with others. For me, I learned that I love to write and that I can use it to help others. This takes time but when you learn to fall in love with who you are, you realize how truly valuable you are and falling in love becomes a way for you to share that value with someone else unconditionally and selflessly. You learn that you are the only one you need to be happy. Sure the first few weeks, months and maybe even years after divorce are full of unhappy moments but it’s not forever. Going through a divorce is a very emotionally hard time and recovering is not quick. But then you adapt to your new life and you start doing things and living again and slowly but surely a new-found happiness emerges that is all your own. You built it yourself because you didn’t give up. This happiness that you learn to give yourself is crucial to a relationship. Although men love to feel needed, no man wants to be the sole provider of your happiness. That’s setting him up for failure and you for more unhappiness. A relationship should add to your happiness not make or break it. So after your divorce, allow yourself to cry. Feel the pain and let it break your outer shell. It hurts but once that shell of the old you is broken, the new you will slowly but surely cultivate a rare happiness that is unbreakable and completely addicting. What man can turn away a woman who has this happiness? You need to heal and accept before you are able to move on. Right after you sign those divorce papers and move out, you are very vulnerable. Your wounds are open and the slightest criticism from anyone becomes salt on those open wounds. They have to heal before you invest emotionally into another man otherwise you may find yourself comparing him to your ex. His faults somehow become entangled with your ex’s and you unnecessarily blame him for the pain your ex inflicted. This isn’t fair to anyone involved and you will only set yourself back. Take time to let those wounds heal and to accept the scars they’ve left. Once you can accept what happened and that moving on is what is best not only for you but your ex as well, then you can let another man in with the capacity to love him for whom he is. Not only that but you’ll be so much more aware of what you want and how to nurture a relationship than before. The time immediately following your divorce will never be known as your happiest memories but it’s an important time. It’s the time for you to take care of yourself and to learn about yourself. I still think back to the day’s right after my divorce and the memories still bring tears to my eyes. Not from pain but because it was in those dark, quiet and lonely days that I realized just how beautiful of a woman I really am. The strength I conjured up that made me who I am today is enough to bring anyone to their knees. The best part is now that I’ve learned to love myself; I’m ready to fall in love for all the right reasons. I now know that I don’t need someone to feel secure and happy, I want someone who can add to my happiness. And the love I have for myself will keep me from settling for anything less than amazing. You can have the same! Just remember that you are worth it and give yourself time right after your divorce. I am a single . i want woman single to live. You sound like a very strong woman. It’s incredibly difficult to be a single mom after a divorce. But trusting in God will get you through it all so keep up the good work. A great guy is out there for you somewhere! Thank you so much. What you wrote was very encouraging. I am a Christian. 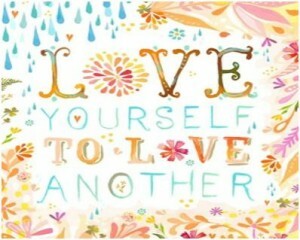 In the bible it says to love others as you love yourself, but often we forget about the second part. Though there has been alot of pain and stress after my divorce and being a single mom, I really learned to rely on God.